Somebody, who was recently leafing through one of my sketchbooks, remarked on how unsketchbooky my sketchbooks are. It's true, of course. Almost all of my books are obsessively finished and presented. I rarely sketch, and have been meaning to change the name of this blog from 'sketchblog' to 'drawing blog' for as long as I can remember. I see every sketchbook I'm working on as being an actual finished piece. As a whole. So, I don't really own any sketchy type sketchbooks. I do, however, have books that are filled with words, quotes, titles, names. References, basically. Ideas and references. They are the closest I get to a sketchbook. In the past I always wanted to be the kind of artists that is really sketchy and loose in the way they work. Here, in a pathetic attempt to show how sketchy and free and easy I am, I turned one of my reference pages into this drawing. Convinced? Nah, me neither. It just looks like a doodle by somebody with a serious mental illness. I have accepted that I am not one of those artists. I'm as obsessive as the day is long. And what's really bugging me about this drawing is that I didn't add more to it, especially in the bottom left hand corner. There's always tomorrow, I suppose. You are still so full of surprises! :) Great spread. I love your obsessiveness in drawing! It is captivating, and it shows through in your work, and gives it an incredible essence. I wish I could be obsessive the way you are! I also love to sketch more complete sketches! At least you got the pencil to the paper, so to speak! Thanks for sharing! your work inspires us. i love the finished quality to your sketchbook pieces. i too rarely sketch, when i start something i try to work on it till it is finished. i also love the fact that you use ink... ah, the danger and the fear of a slip of the pen. i'll be back, keep on drawing! I'm with you there - tried very hard to paint/sketch loosely but it genuinely distresses me to leave something 'unfinished'! I think we have to accept our style as it is - nothing wrong with yours, it's wonderful, I love all the meticulous detail. 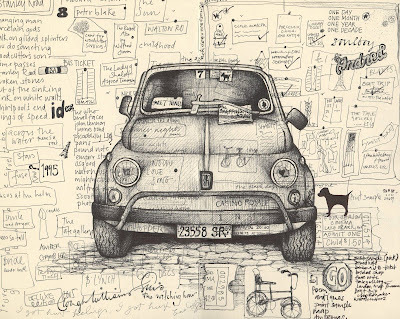 Wonderful car drawing! And great page - I love your obsessiveness (hope that's a word?!) : ) ! It still looks like great art to me. I'm actually pleased to note that you're not a sketchy sketcher. I too struggle with that but have been trying to loosen up and even sketch outdoors from time to time. Maybe we should just go with who we are and not try to fit into any notion of comformity. An art teacher once told me never to use black in my work. Paa! Who wants to conform? I agree with what everyone's said here - your obsessiveness is what makes everything you do so special and addictive. I just stare at it and think "how do you have the patience?" Why should we do sketchy sketches anyway? It drove me nuts at art college that you had to show the development of every idea on the page. I do all the development in my head - I ended up having to go back and pretend a development after I'd done the finished thing or I'd lose marks. Ridiculous. There's nothing wrong with proper sketchy skecthbooks for people who like to do them, but there's nothing wrong with not doing them either. You carry on as you are. Sketching, drawing--who cares--your stuff looks great! Your detail is tremendous. What a gorgeous peek into such a creative brain. Grrr... I even love your sketchie stuff. Grrr... You're so good. Who needs a sketch book when you have such clear ideas of what you want to produce? I am constantly amazed by the direction you find in your work and the superb detail. I like collecting ideas from peoples work but I could never match yours! I'll still looking for my path! you have a very good blog , and your work is great! Alison, just had a peek at Rima's blog. Very nice, too. Thanks for the recommendation. Rachel, maybe because I didn't go through that art college process, I never got into those habits? I can see how it could be useful, though. Glad u start drawing bikes. essential! may be some little progress to make. for trainning check out http://vanillabicycles.com/. i'm not surprised u'love Blake. hope it's peter. it must be peter. Perhaps we can meet in the middle? I'll toss some half-finished sketch plus class note filled pages your way, you send some amazingly polished ones mine? I love your obsessiveness too. We all have to stay true to our talent! I don't mind how you arrive at the result, just please keep doing it! I do love this spread - it's amazing. Obbessive can be positive after all. What a flippin' amazing spread. Looooooooove the cinquecento. In a nutshell: I studied art therapy in graduate school, and just for your interest, none of your drawings are anything like anything produced by "someone with a serious mental illness." They are delightful.